Use these efficient and effective cups for both hot and cold beverages! Our Eco-Friendly paper cups interior is PLA Coated and made from renewable resources and are Compostable and Biodegradable. This product may be Screen Printed or purchased without imprint. Unlimited number of imprint colors! This can be printed only on 1 side. Free PMS matching. Metallic and neon ink colors offered at no extra cost. Made and printed in the USA. 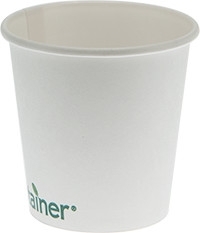 Backside of cup is pre-printed with the "Ecotainer" Logo. This is not considered a defect. 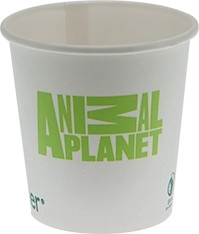 Can be printed only on 1 side for Tradition due to the backside of the cup is pre-printed with the "Ecocontainer" Logo. The color of this pre-printed logo could vary, manufacture's discretion.